Two unlikely worlds collide in The Taste of Ashes, a story of redemption and the resilience of the human spirit, even at its most frail and vulnerable. Isabel Lee’s early life in rural BC was forever changed by a brief but powerful love affair with a young priest. Now a recovering alcoholic, Isabel struggles to pull the tattered fragments of her life together and repair the damage to her relationship with her estranged daughter. Once idealistic and hopeful, Father Àlvaro Ruiz now has his own demons to confront. Brutally tortured at the hands of the Guatemalan authorities and unable to escape the wounds of his past, Àlvaro returns to Canada seeking sanctuary, a broken man with a tenuous grip on his faith in God and humanity. Isabel’s and Àlvaro’s stories slowly weave together and they are eventually faced with their greatest challenge yet: can they carry on in the wake of the damage and bring themselves to forgive? Compelling, disturbing but ultimately hopeful, this is the story of how we find grace in the most unexpected places. Sheila Peters’s novel, The Taste of Ashes, does not feel like a first novel. It’s carefully crafted, multi-layered family narrative is complex and lyrical in a way that reveals Peters’s history as a poet and short-story writer. The three primary narratives that follow Isabel, Álvaro and Janna’s individual stories are interwoven in such a way that even a few convenient coincidences – which could have seemed contrived and artificial – feel genuinely spontaneous and natural. Álvaro’s history is the most complex and his broken psyche and body, the result of brutal torture at the hands of Guatemalan authorities, are what bring The Taste of Ashes out of the realm of the ordinary. Peters’s masterful description of the aftermath of torture, the anger and shame and fear that Álvero still feels creates a character that readers will find both frustrating and sympathetic. His interactions with the other priests in his brotherhood, his questions about faith and God’s role in his life and the stages of his healing are fascinating and have an air of authenticity. This is a novel about families and family secrets. When should secrets be kept and when should they be revealed? How important is it that people know who their biological parents are? Are there circumstances when it’s best they aren’t told? What kind of mother is Isabel? Are her actions forgivable? Should her children have been removed from her care? Does her recovery ring true? How do Janna’s and Álvaro’s journeys parallel each other? How does Isabel’s life parallel that of Álvaro’s mother? 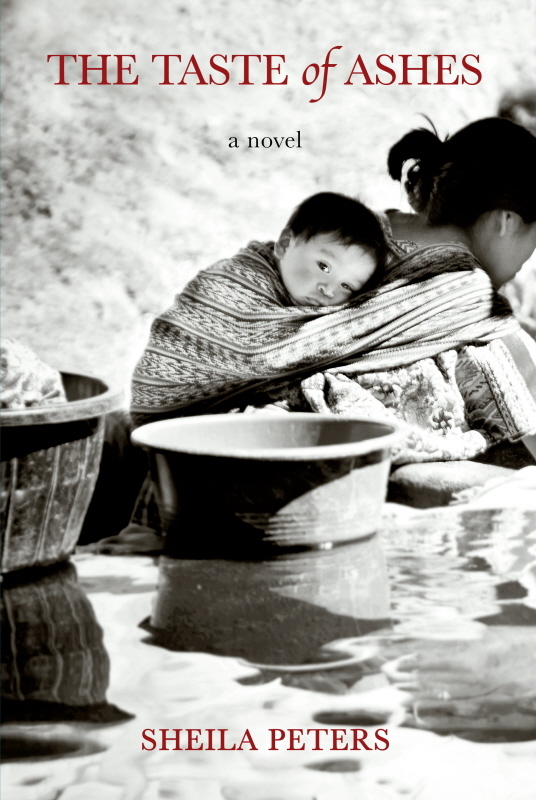 The turbulent politics of Guatemala and the resulting violence have an important role in this novel. How does the impunity of those with power in Guatemala compare between with those who have power in Canada? In what ways do Isabel, Álvaro and his mother resist the forces moving against them? In what ways do they succumb? How and why did Isabel retreat to her garden? What did gardening do for her? We read about rituals, some deeply rooted in a specific culture, others created by Isabel, Janna, and others. Do the rituals people make up for themselves fulfill the same purpose as more traditional ones? What meaning does the title evoke? Walter is a strong character who could be said to represent some of the worst characteristics of the Catholic Church? What are those characteristics and how did you respond to them? How is he a positive force? What part does religious or spiritual belief play for the novel’s characters? How do the indigenous cultures and the Catholic culture compare? What clothes people choose to wear can reveal a lot about them. What role does clothing play in this novel? The novel portrays young people in various stages of life. How do they differ? What do they reveal about each other? What role does Amy play? Dustin? S L O W L Y given the story, and it really it is not until the end that we really understand it all. We have all met women like Janna, hoeing a pretty tough row, sometimes making very poor decisions for herself, but underneath everything she is a good soul, doing her best. Give this book to all your friends to read, and cheer. I read this book in 2 days. I really enjoyed it and I loved all of the characters, – especially Trevor’s character. When a book elicits genuine emotion from the reader (i.e. me), I know it’s a really good book, because it means that the characters are very believable and the reader is rooting for them. During the part when Trevor talks to members of his family and extended family, I had tears gently rolling down my cheek. What I loved most about this book, is the unique way each character finds his/her own redemption. Redemption is not a one-stop-shop-one-answer fits everyone. This book beautifully illustrates how redemption is uniquely individual for each person. I think this story would make a great movie. Thanks, Kathy and Janna, for your very kind words. Isabel, Janna, and Alvaro are not always likeable, I know, but I feel like they’re old friends whose attempts to find meaning and reconciliation in their lives outweighs their faults. And yes, Trevor is a rock.